Display is 14 digits, Nixie tubes. 4 functions & memory. The knob at top left of the keyboard sets the fixed position of the decimal point. 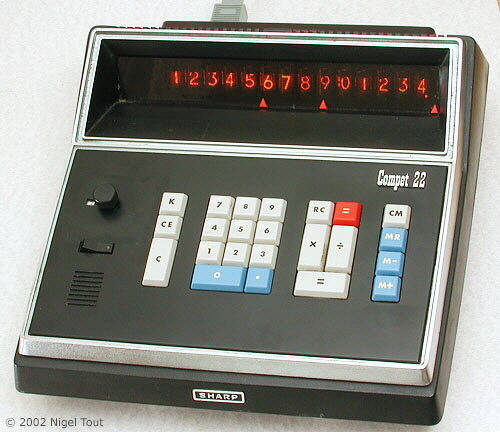 The calculator has a socket at the rear for connection to a "memorizer" for converting it to a programmable calculator (see photograph below). The model 30 memorizer provides 30-program steps and sold for US$305, and the model 60 memorizer provides for 60-program steps and sold for US$444. The memorizers would also work with the Compet 32, 33, and 50. 280 mm wide, 315 mm deep, 125 mm high (11" x 12.5" x 5"), 4.5 Kg (10 lbs.). Has one 10" x 9" board and one 10" x 3" board with Medium Scale Integrated Circuits (MSI) in cans. Advertised in Electronics journal in September 1968. Made in Japan by Hayakawa Electric Company, which changed its name to Sharp Corporation in 1970. Significance: This is an early design using MOS (Metal Oxide Semiconductor) Integrated Circuits, and is a development of the similar 12-digit Sharp Compet 16. With the "memorizer" unit it is expandable to provide the then uncommon feature of elementary programmability. 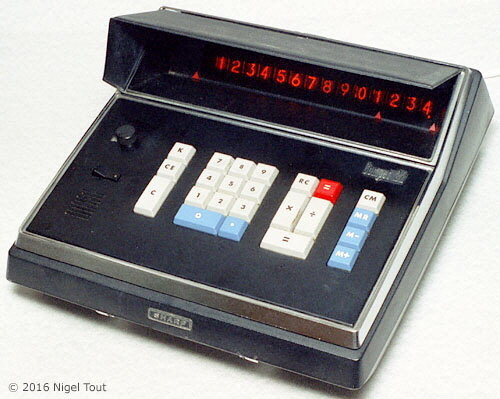 Sharp were calculator pioneers, introducing the first Japanese transistorised model (CS-10A) and rapidly improving and miniaturising. 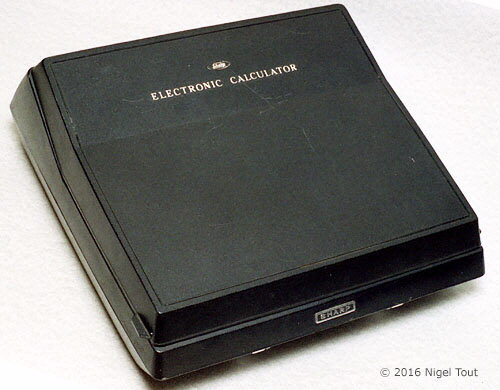 In 1969 it introduced the first calculator using Large Scale Integrated Circuits (LSI) (QT-8D), followed by one of the first battery portable calculators (QT-8B), and one of the first hand-held calculators (EL-8). Sharp Compet 22 with its hard plastic dust cover in place. Sharp Compet 22 with its display shade in place. This is probably missing its right-hand flap. 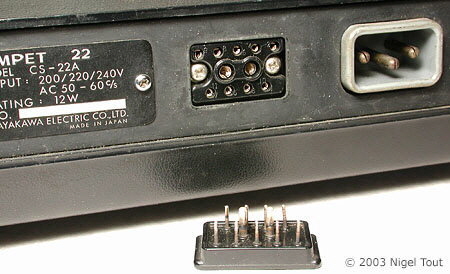 The multi-pin socket at the rear is apparently for connecting a "memorizer" unit which converts it to a programmable machine, as described above. The plug has to be fitted when using the calculator without a memorizer. 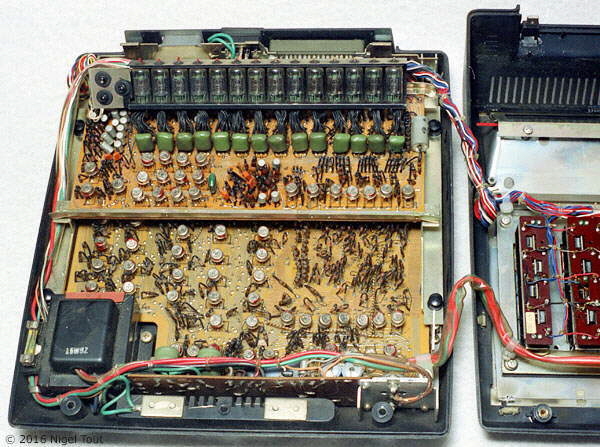 The casing has been opened to reveal a large circuit board underneath and a small circuit board with the Nixie-type display tubes above. The upper board has been unclipped and moved to one side to show all of the lower board. 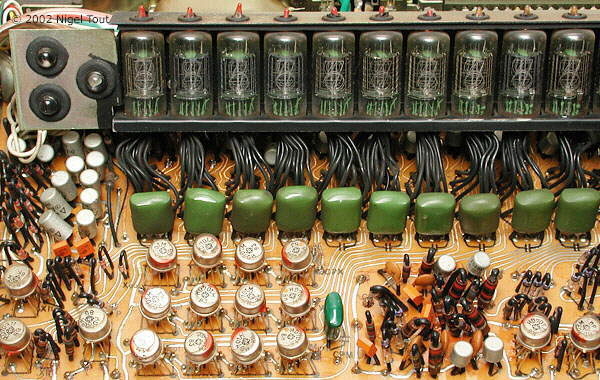 A close up of part of the upper board showing the Nixie-type display tubes, with a line of green capacitors below, and various other components around. 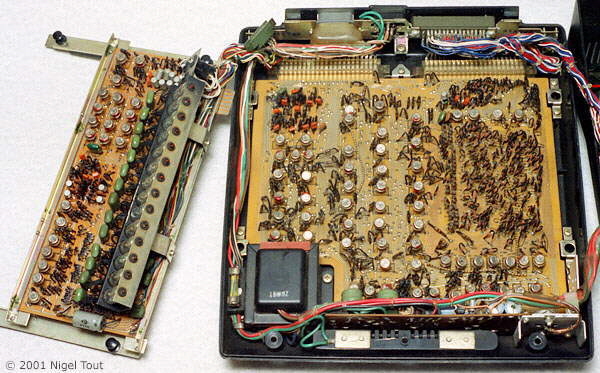 The large metal cans, which have 10 leads, are integrated circuits from the Hitachi HD70xM series, and here are date coded 1968. There are also many small resistors and diodes standing on end. "Japanese show off calculators, some with program, others low-priced", Electronics International, Jun 9, 1969, p204. Electronics, Sep 14, 1968, p219.